You've said that opera has always been about the gods. What exactly did you mean by that? 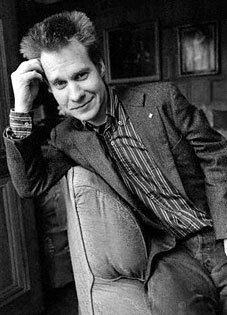 PETER SELLARS: Well ... human beings need permission, and usually that's metaphor, to recognize that there are many layers of reality moving at any given moment, and that every small gesture has very large consequences. So opera is this amazing form, which takes a gesture, and understands it through music, poetry, dance, visual art, all at the same time. "The artist's work is to lift people out of their usual sense of their own cosmos into a higher vision of what's going on up there." A whole galaxy is in place around these four actions. You thought you were just writing a letter to someone, but in fact, there was a whole symphony orchestra playing. In fact there was a chorus singing. In fact, it's like a bigger deal. Opera constantly gives you that perspective shift; that glimpse of spiritual activity inside of the simplest and quietest moments. For me, one of the hardest things to deal with about the 20th century — and I'm very relieved that it's finished — is that it was so absorbed in psychology and the self. Psychology is probably the least interesting thing going on in your life. At the end of the day, reducing your life to your own psychological problems is to devalue your place in history, is to devalue your political commitments, is to devalue what we're all doing here for each other. It is to devalue what overwhelming waves of spiritual energy or insight are breaking upon us, in the midst of these catastrophes, and not to get that life is difficult for a reason. It's not to get that we are actually being pushed, and pulled, and drawn out of ourselves. That's what's so liberating about opera, because nobody can do it alone. The soprano is dependent on the oboe player, who is dependent on the person whose finger is on the switch on the light board, who is dependent on the person who raised the curtain, who is dependent on the person who tore the ticket, who is dependent on the person who served you your drink at intermission. Hello! You're having this total experience. No part of it could ever be isolated — it's only possible because the whole cosmology comes into play. And human beings are doing this astounding thing, which is working together to make something that is way beyond their individual selves, or capacities, and that lifts everybody to a new place. SELLARS: One of the things that artists can do is liberate theology from doctrine. You know, one of the things that I've been working on for the last dozen years is staging the sacred work in a secular context. I've been staging the life of St. Francis, a Buddhist sutra, and now the life of Mary. But not in a church, not in a synagogue, not in a mosque. In a theater — in a secular society. Start with the fact that Michelangelo is very insistent that there's only one direction you can look, which is up. You've spent your whole life looking at your feet, and now, guess what? Look up. That's very beautiful. That sense of lifting people out of their usual sense of their own cosmos, into a higher vision of what's going on up there, is an artist's strategy. You feel it physically, in the back of your neck, as you stand in the Sistine Chapel. It's exhausting. You can't look that way for a long period of time, and suddenly you realize how out of practice you are, in terms of living in that stratum of experience. It's a strain. What's marvelous is that church teachings are embedded in this experience. But also, the experience itself goes beyond the letter of the law and moves into the realm of the spirit. And, I think, over the course of history, theology has always had to be liberated through poetry, through music, and through images. So now that we're in the 21st century, where do you see us going? SELLARS: Well, for me, two of the things that are so liberating right now are that women are artists, and we know their names for the first time. You can't read Freud again the same way after Alice Miller. Alice Miller just says — Wait a minute, we're not going to swallow this Freud stuff. He needed women to be a certain thing to prove his theories, but in fact women aren't that. As you know, in World War I, 90 percent of the casualties were soldiers. And in our current wars, 90 percent of the casualties are civilians. Women and children are now the targets. And maybe they're hysterical for a reason; maybe that hysteria is not out of control. Maybe they see something that everyone else is denying. And actually, let's talk to those abused women and children, and begin to recognize some things that we're sensitized to in a way perhaps Freud wasn't. So to me, it's the idea that the hysterical woman now has a voice. So often, theological writings by men are primarily concerned with the mind. C.S. Lewis does it magnificently, but it's an imaginative universe. It's all in the mind. Women's spirituality tends to be quite the opposite. It's in the body. It's in the flesh. You are mother Mary. You are carrying God's child. It's not an idea. It is in your flesh, and bones, and blood. And this incarnated spirituality, this spirituality that is in a woman's body, that is connected to the earth, and connected to the sky, and connected to the miracle of birth, is very different. For me the 20th century was most profoundly witnessed by Simone Weil in the heart of France, during the Nazi occupation. And in the tradition of the women mystics — whether it's Hildegard of Bingen, or Theresa, right through our own period with Weil, women are the ones asking the question of — What are we really doing? Who is starving? What are the conditions of the workers all over the world? These are the proper questions for theology. These are the proper questions about how we are doing, as humanity. And it took a woman like Weil to say — I'm not just going to correspond with my colleagues in the philosophy department. I'm going out to this Renault factory, and I'm going to work on the assembly line. — Simone Weil trying to teach Plato in the Renault factories, in 1930s France. And it took a woman intellectual to say in 1943 — Yes, I'm living here in London. It's comfortable. There's enough food. But I will not eat one more bit of food than my fellow citizens are eating in the camps at this moment. — Recognizing that our fates are that intertwined. Recognizing there's no backstage and forestage. We're all one picture. You're very much an optimist. In the 21st century, what is going to cause a shift away from self-absorption? God is fond of a contrite spirit. And sometimes the only way to get past the ego is when it's finally, horribly, violently crushed. And you feel like nothing. And you can take your first honest steps. So, "optimism" is not the word I would use. I would say "hope." It's no accident that societies that have the most material advantage have the least hope. If you spend your life in parts of the world like Bangladesh, or central Africa, where people should not still be alive, how can they be alive one more day? It can't be possible. And yet, they're alive, again, today. That's about hope. You've dealt a lot in your work with love, as it's expressed in great works of art. What have you learned about the connection between spirituality and love? SELLARS: It's one of the longest and deepest traditions, particularly in Sufism and Islam, that we spend our lives in longing. And that the deeper this longing, the more sense of the beloved. God is known to us through his absence — Simone Weil is also beautiful on this point. Because love is measured in how in love you are with somebody even when you're not near them — especially when you're not near them. Do you still keep them in your heart? Or, is it out of sight, out of mind? So, absence is the demonstration of this love, this longing for the distant beloved, this devotion to what your eyes can't see. And offering everything you can offer to what your eyes can't see is the most beautiful gesture, of focusing all your attention outside of yourself and overcoming the nightmare of selfishness. And finally just living for others — living for larger community — living for your love. The history of art is mostly about that kind of devotion. I only have to say the words "Romeo and Juliet" and right away you go to a very special, amazing, beautiful place that feels so warm inside. They defied every convention — the racism and bigotry of their parents, the divisions of their society, the political and social barriers. And as two young people, they chose to live for their love. That they also died for it doesn't make the story less compelling, but more compelling. So love is about understanding things don't work out the way you had in mind. In the process, you're almost destroyed. Or maybe you are destroyed, as Romeo and Juliet were destroyed. But that destruction is the threshold to a love that echoes across centuries. Sickness takes you out of the affairs of the world, out of all these petty things that you think are so important every day. And the pain itself sharpens your focus. I mean, it's very moving, because I think a lot of physicians in terminal wards are recognizing the limits of science. And that actually science, technology can't help you with a good death. What does it mean to die well? It's the science of the heart. And in the long view, the absence is as important as the presence. Who's still with us, really, and how we live for them still. You know, in most cultures, theater, dance, and music were never intended for the living. They were always for the dead. In Korea, in Africa, in aboriginal Australia, you danced for the spirits of the dead. To let them know you're still thinking of them, you still care about them, you still cherish them. And if they died in pain, if they died in unhappiness, if they died with something incomplete, or in the midst of injustice, you spend those years making it up to them. And letting them know that your life won't be in balance either, until it's made up for them. Most of the history of art, over and over again, is about death. We're a society that can't really deal with it, but most of Bach's music is about dying and how to die, and the meaning of death. The culture in Tibet is all around dying well. The science of the heart, in Central Asia, is totally understanding every day of your life in terms of death, because it's your meditation on death that empowers your life. As soon as you acknowledge that you may not be here five minutes from now, or five days from now, you ask yourself, "What is important to do?" Death is the best guarantee against wasting time.